As soon as I wrote the post, A Note on Arab Literacy and Translation, a number of issues arose in my mind, some in relation to the UN’s Arab Human Development Report (AHDR) and some in relation to my own analysis of the data. First, out of the twenty two counties analyzed in the AHDR, what exactly makes them “Arab?” Is an Arab defined by language, ethnicity, religion, location? Secondly, how many different languages are spoken and written in this Arab region, and how might that information change the translation statistics, and finally, what other data, if such data exists, on specific countries or regions might shed a more positive light on the rather bleak statistics? The first question, what defines a person, country, region, as “Arab,” was also asked by The Economist in its July 25-31, 2009, issue. This issue, released right after the UN’s 2009 AHDR, served as a follow-up to a special report it published in 1990 on the Arab world. At the time, as the communist block in Europe was breaking up, the entire world seemed to be facing a socio-political-economic shift. The Arab region, however, seemed locked in a time warp of never ending conflict and totalitarianism. Today, it appears that very little has changed. Hosni Mubarak is still the president of Egypt after almost 3 decades; the Tunisian president Zne al-Abidine Ben Ali has been in power for 22 years; Saudia Arabia is still ruled by the al-Sauds. It seems that so little has changed. It might help to define the region geographically. The 22 countries included in the AHDR and in The Economist’s special report are all members of the Arab League, or, officially, the League of Arab States. Formed in 1945 by Egypt, Iraq, Jordan, Lebanon, Saudi Arabia, Syria, and Yemen, the League’s membership now also includes Mauritania, Morocco, Algeria, Tunisia, Libya, the Palestinian Territories, Sudan, Kuwait, Bahrain, Qatar, the United Arab Emirates, Oman, Somalia, Djibouti, and Comoros. The report confirmed my suspicion that it is impossible to define this region by ethnicity or religion. While Arabic is one of the main languages across the region, so is French. Additionally, Arabic itself differs vastly across the region. The Arab dialect spoken in Morocco is different than the Arabic spoken in Syria or Egypt. Even the people who we define as “Arabs” don’t agree on who an Arab is. 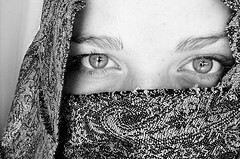 In the Annual Arab Public Opinion Survey of 2009 35% of respondents (polled in Egypt, Jordan, Lebanon, Morocco, Saudi Arabia, and the UAE) said their identity was as a citizen of their country, 32% said their identity was as an Arab, 32% said their identity was as a Muslim, and 1% claimed identity as a citizen of the world. With almost an even split between national, regional, and religious identity, it seems almost impossible to group together statistics about “the Arab world” or about one individual country. I’m still convinced that language must play a key role in the definition of the Arab world. Arabic, of course, seems like the logical regional language—after all, we are discussing the Arab world. As would be expected, all of the twenty two Arab nations recognize Arabic as an official language. Other languages are key players in these nations, however. Two of the twenty two Arab states recognize French as a national language: Comoros and Djibouti. Egypt, Lebanon, Morocco, Mauritania, and Tunisia are member states of the Organisation Internationale de Francophonie (OIF). Membership in the OIF indicates that a significant portion of the population is francophone (French speaking). That Egypt, Lebanon, Morocco, Mauritania, and Tunisia are all members of the OIF signifies that the French language is culturally the norm, but not used in political situations. Literature, film, music, advertisements, etc. may all be in French in these nations, but French is not officially recognized by the government. All in all, the total of French-speaking Arab states is 7 out of 22 or 32%–a significant minority in a region defined by the term Arab. In Algeria, Tamazight, one of the Berber languages, is an officially recognized language along with French and Arabic. Comoros and Djibouti also recognizes Swahili, a language definitively African; Djibouti recognizes Somali; Iraq recognizes Kurdish; Lebanon recognizes Armenian; Somalia, of course, recognizes Somali; English, in addition to Arabic, is an official language in Sudan; Urdu, Hindi, and Persian are all recognized in the United Arab Emirates. The number of dialects and regional languages in addition to those recognized by the government is staggering—and all these languages exist in a post-colonial setting. Under colonial rule, English, French, Italian, and German were the official languages, so it is heartening to see so much linguistic diversity in a region that gained its independence relatively recently. Given that the AHDR analyzed only English to Arabic translation statistics, it would be interesting to discover the English to French or English to Somali/Persian/Armenian/etc. statistics. Granted, they would be slight—Arabic is the dominant language in the region—but they might change the report for better or worse. Are French books more widely available than Arabic (especially those in the humanities)? What is the market for French or Armenian translations from English? As of now I can’t find anything compelling to answer these questions, but it’s worth a hunt. Finally, is there anything hopeful about literacy and translation in the Arab world? Is education as bleak as the AHDR painted it to be? One positive statistic from the Peterson Institute for International Economics, is that “on fundamental social indicators such as literacy, poverty and education the Arab countries do as well as or better than most other countries with similar incomes.” Unfortunately the huge regional differences in the Arab states prove this statistic completely relative. The United Arab Emirates is certainly more literate than Somalia—generalizing across the entire Arab region smoothes out the sharp ridges of poverty covering much of the geography. The Economist itself found that the six desert monarchies—Bahrain, Saudi Arabia, Oman, Kuwait, Qatar, United Arab Emirates—increased literacy rates by 75% since 1970. Again, this is a huge gain for a region faced with a significantly illiterate population, but, again, this represents the wealthiest region in the greater Arab region. These six countries have spent at least $50 billion to-date on higher education. This year Saudi Arabia’s Abdullah University of Science and Technology will open with a personal royal endowment of $10 billion. While these figures are staggering, they are limited in scope. “So far, however, higher education in the Arab world at large has produced few critical minds. Most Arab universities are victims of ‘massification’: Egypt shoves 30% of the relevant age group into university, of whom fewer than half graduate.” Gains in education marked by huge regional discrepancies: this seems to be the overarching framework of Arab literacy. In some places much of the population is literate and well-to-do. In others, most of the population is illiterate and earning less than $1.70 per day. There seems to be no common ground to rest on in this region—everything is an extreme. The reasons for the extreme poles of literate and illiterate, rich and poor, are varied and complex (and inconceivable to many in the Western world). Is the Arab world an area without hope in terms of literacy? No, I think that is too broad of a statement—just like the term “Arab world” is much too broad to encompass the diversity of the region. Yes, the Arabic language connects all twenty two of the Arab states, but at least tens of other languages are officially recognized or widely spoken. The Arab world, however it is defined, is certainly facing a problem: most of its population is under the age of 30 and much of those young people are uneducated. With little to no education available in much of the region and the business sector on the rise (in addition to government bureaucracy behemoths which employ millions of people), education is essential; access to literature is essential, and the limitation of both is crippling. Although I have worked and taught in the Middle East for over 5 years, I would not have been able to write such a brilliant, objective, engaging article on the state of education. On comment I have is that it’s very difficult to suss out the real value behind well-publicised token gestures for education. The rich desert states are used to immediate results and success, they find it difficult to accept that education is a long-term commitment that needs to be followed through. There are false starts in educational reform every 2-3 years. Great projects start, get all the publicity and support until someone decides (based on dubious data) that it’s not successful, the project gets scrapped and another project is started. It’s all motivated by the best intentions, I’m sure, but that’s not enough. What I am disappointed about is that I was hoping that the rich Gulf states will use their educational success to help their less fortunate Arab brethren by providing them with good education in Palestine, Syria, Lebanon, North Africa, Pakistan, Afghanistan you name it. We’ll have to wait for that…. Thank you for your work on this issue. I’ve often referred to your two August 2009 articles on this subject. Can you consider doing an update on the topic, now that it’s been a few years? Thanks so much for your work and for your time.